"Les Misérables" no doubt is one remarkable and epic experience. The way they moved the juggernaut material is already a feat in itself (but it is no way perfect). You also cannot deny the emotive power that this film brings out - the way it tickles your funny bone at the precise moments and the way it moves you towards heartbreak and sadness as easily. Questionable decisions slightly hamper the film - with the obvious miscast of Jalvert with Russell Crowe and the camera that moves and moves and moves all over the place - but these are slight indiscretions in a mostly wonderful musical adapatation. In 1815, Jean Valjean (Hugh Jackman) is released on parole by prison guard Javert (Russell Crowe) after serving a nineteen-year sentence for stealing a loaf of bread. One night, he is offered food and shelter by the Bishop of Digne (Colm Wilkinson) but instead, Valjean steals the convent's silver during the night but he is caught by the authorities and presented to the Bishop. Instead of telling the truth, the Bishop testifies that the silver was given as a gift thus relieving Valjean of the accusation. Moved by the Bishop's generosity, Valjean breaks his parole and vows to start a new life. Eight years later, Valjean is now a factory owner and mayor. Fantine (Anne Hathaway), one of his workers, is discovered to be sending money to her illegitimate daughter, Cosette (Isabelle Allen). Unfortunately for Fantine, she is dismissed by the foreman without Valjean's knowledge. She is forced into prostitution. As fate would have it, as Fantine is almost arrested by Jalvert, she is saved by Valjean. 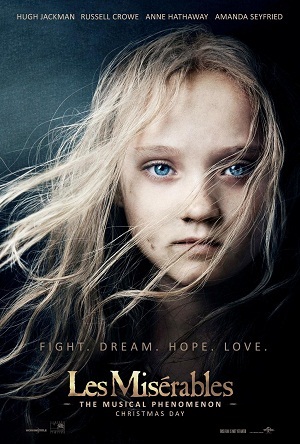 As Valjean promises to take care of Fantine's daughter, their lives are changed forever. Epic set pieces, memorable performances and moving material are only some of the things that make "Les Misérables" one heck of an experience. The bloated material in fact is amazingly mostly well-paced. The almost 3 hour film did have its long moments but this is far and few in between. Of course, the songs did help but we also think that superb acting is a bigger part of the mix. Props goes to Hugh Jackman and Anne Hathaway as we think they stood out among the rest. Russell Crowe we do think was the weakest link for "Les Misérables". Not only is he an atrocious, near monotonous singer but we felt that his Jalvert rendition could have been a little bit better or meaner in fact. Another minor quirk is the camera movements done by Tom Hooper. We did love the zoomed-in approach to some of the performances of the leads (mainly Fantine and Valjean) - the hyper-realism of the "sincere" facial expressions and the live singing is something to behold ("I Dreamed a Dream" by Anne Hathaway was simply stunning) - but his other choices left as scratching our heads. There were a lot of unnecessary camera swooping to the point that some even repeated themselves numerous times during the whole movie. Again, these are minor complaints to a remarkable film. Fans will love this for sure and for non-fans, this is a good time to start knowing what "Les Misérables" is all about. - Russell Crowe's singing is something to "behold"